Businesses of all sizes up and down the UK are taking advantage of the coffee to go opportunity. Customer feedback helps us understand how our coffee machines are supporting businesses and adding valuable income to stores. So, we decided to talk to a couple of them. Simon Baggaley, Category Manager for NESCAFÉ Coffee Machines, talks briefly about customer feedback on our coffee to go machines. View the full length video here on our YouTube channel. 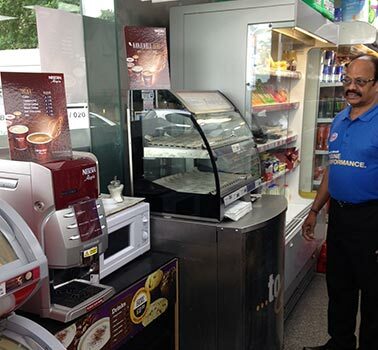 Following the recent addition of the new-look NESCAFÉ® &GO® machine to his store in East Molesey, Anish has seen an increase in new customers. “We open at 5am and there’s a lot of passing traffic as people walk to work. Advertising the fact that we sell a recognisable brand of coffee such as NESCAFÉ® with a swing sign outside the store brings in new customers, looking for a hot coffee for their journey. The machine itself is exactly what our customers are looking for, a simple self-service machine with plenty of choice. The cappuccino is our biggest seller, but the hot chocolate and latte are also customer favourites. The morning is a key time for passing trade looking for a warming drink and the NESCAFÉ &GO machine allows for cross-promotion, making us a takeaway destination as well as a convenience store and encouraging customers to pick up a cereal bar or croissant too. What impact has serving coffee had on your business? Plenty! People see the [swing] signs, they come in buy a coffee, buy some sweets, chocolates and sandwiches. So it has really brought people in and it has increased our sales. What was important to you and what factors did you take into account when selecting the right coffee machine for your business? What do you think is the most important factor to your customers when it comes to offering coffee to go? Is it price, variety, quality, brand, etc, or all of these things? What feedback do you get from customers? I have people coming in from the other side of the town because it [the coffee] is so good – the price and the quality. So it is absolutely spot on. What made you think of wanting to offer coffee to go in the first instance? Customers' requests! I was asked [about coffee] time and time again so I knew there was demand there. And it was available at the right price too. What are your top 5 reasons for offering coffee to go? What factors are critical to offering great customer service and support for your coffee machine? The [beverage] ambassador we have and the support we have at the end of the phone. How important is ongoing training and marketing support to your business? Absolutely 100%, you need that support all the time. Getting out there shows what you sell. Why did you choose Nestlé Professional and NESCAFÉ? The brand and the price is absolutely perfect for our business. There is a [branded coffee shop] just round the corner and in comparison, people have said they rather pay a pound for ours rather than pay about £2.80. So it comes back to quality and the right price. Hot drinks helped with the morning trade. Coffee sales brought in extra sales. It is a simple and easy to use coffee solution. What do you think is the most important factor to your customers when it comes to offering coffee to go? Is it price, variety, quality, brand, etc, or all? The price and quality is great for what you get. Good quality, easy to use [self-serve] coffee solution. We are a fuel service station and wanted to offer customers a hot drink. Easy money maker, doesn’t take up a lot of space and hot drinks help the sales of food. Promoting the coffee and having everything available for the customer to buy. The business trends are changing weekly, so having the new products available with the POS to support is important. The NESCAFÉ brand and the help and support provided by coffee ambassadors. No other company provided that support.